Hier stimmen Preis, Service und Qualität der Firma Jansen. Ich benutze die Maschine jetzt über ein Jahr um unsere kleine Wiese zu mähen. Tolle Maschine, wir haben ein kleinen Schlepper mit 18 PS, völlig ausreichend dafür, da ist noch Luft nach oben, tolles Mähergebnis, kraftvoll, laufruhig, einfach zusammengebaut und sehr robust. nach dem sehr netten telefonat mit ihrem habe ich den mulcher für meinen kleintraktor bestellt, da ich keine lust mehr hatte, alles mit meinem aufsitzmäher zu mähen. wir haben ein großes grundstück mit vielen obstbäumen, und da ist der schlegelmulcher wesenbtlich besser als der rasenmäher. kleine äste werden mühelos kleingeschreddert. ich brauchte zwar etwas hilfe bei der inbetriebnahme, aber danke des netten telefonates mit herrn hans war der mulcher nach kurzer zeit einsatzbereit und leistet seitdem hervorrragnede arbeit. frage: gibt es die riemen im handel oder kann ich die direkt bei euch beziehen? 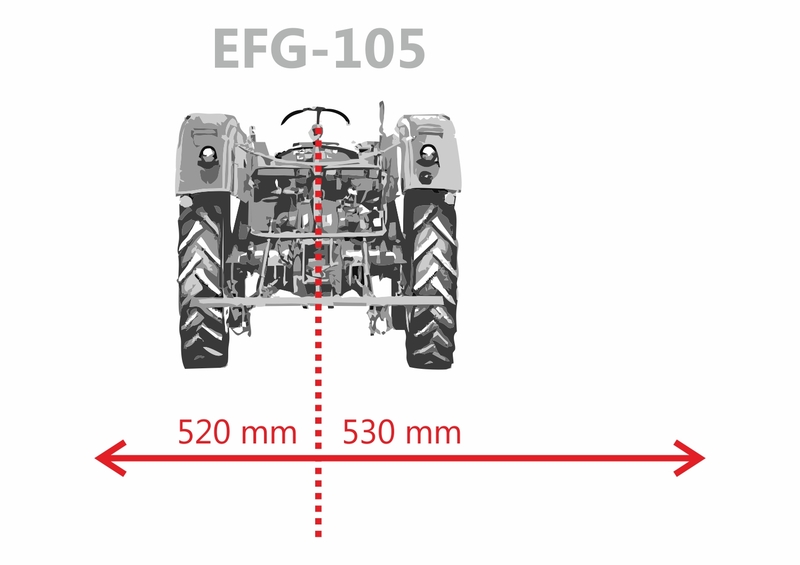 The especially robust construction of the mulch mower EFG-105 makes it stand out. It has a special reinforced angular gearbox and is outstanding in its operation. The flail mower has a mowing width of 103 cm and is driven using a P.T.O, included as part of the delivery. This mower unit has the most heavy-duty gearbox in its class. Unlike mower units equipped with light Y blades, this mower has high inertia generated by the heavy hammer blades and heavy shaft. This allows our machine to perform better. The 16 specially hardened, 0.4 kg hammer blades, which are arranged on a double spiral drive shaft, shred clippings to a minimum size. Even very high grass, bushy or straw-like clippings are no problem for this mower! The mulcher also has a trailing roller and a freewheel gearbox. The cutting height can be set with the top controller and runners mounted on the side. The suspended, galvanised slats at the front of the mower unit prevent stones escaping. The mower unit is hung using the three point linkage of your tractor (from Cat. I. upwards). Your tractor should have at least 25HP. Compare our machines with competing products! You won’t find anything comparable. We didn’t only develop these devices ourselves, but also offer excellent service (master technicians workshop) and spare parts. We have almost every part in stock. In the event of questions or problems we are only a phone call away. With us you speak with knowledgeable staff and not with “call-centre agents”! We have most of all our products assembled and ready for operation in our exhibition halls. We would love for you to come by to test them! The mower unit is delivered in a robust wooden crate. The gearbox is dry and must be filled with oil (80W90, approx. 1 litre) prior to use. All from "Agriculture & Forestry"